When I was a little girl, I remember sitting in church and watching all the older ladies pull out their reading glasses when the sermon started. I giggled at the fact that they all had the same case for their glasses, and to me it looked like they took a potholder and folded it over. Well the other day I was helping my husband clean out a classroom at church, and I found an old dusty box of random potholders with our Church's name printed on the back. (What type of "potholder ministry" this was a part of, I can only imagine...) I immediately fell in love with the kitschy little print, so obviously I stole rescued them and began thinking of what fabulous things I could craft with them. But, um, what should I do with the other 68? Maybe a bag to carry hot food in for potlucks? Sew a few squares together and make baskets? lol why so many indeed! I got one while serving as a missionary from someone in my church a few years back. They had turned it into a small first aid kit. They put snack size ziploc bags sewn in the middle so when folded in half, it was like a book of plastic bags. Then they put band-aids and such in each bag. I think there were three bags. Then they put a cute button on the outside and a loop to close it. It was very cute and great to just have thrown in my bag. I even kept girlie emergency things in it. They would also be great as a little clutch bag for phone and keys and small wallet if you sew two together. Good Luck! I've seen them used as the top part of a cute little child's apron, the bottom being a dishtowel. I'm pretty sure there is a tute on a blog somewhere if you google it. :) ~Lanie J.
Sew them together to make a outdoor summer playmat. They really are cute. I might even leave the tag as is - you never know when it'll come in handy ;) Love the print!! You could do something like that! Seriously, I think you can use 2 or 3 dozens to make glasses cases and ask children from your church to give them to old people (either from your church or from any old people home). Another dozen would probably make a fun changing pad for a baby. Then, you could make the cases zippy to turn one into a make-up pouch for you and one into a sleeping bag for Paige's (Barbie) doll. So that makes 50 of them taken care of. Such a cute print! And I love the glasses case idea. You could always make a little quilt with them or coasters. Hmm? I hope you show us what you decide to do with them. I could imagine some cute pennant banner design coming from them potentially. I'm not sure how much square footage you would get from them, but some cute blanket/seating cushion for grassy picnics or sitting on any kind of bleachers/benches to protect you pretty clothes? Good Luck and let us know what you do with them all! Such a cute find! And thanks for the glasses case tute too! Excited about the possibilities.. I like the blanket idea! You could hook them together for a book and use the pages to make a quiet book. 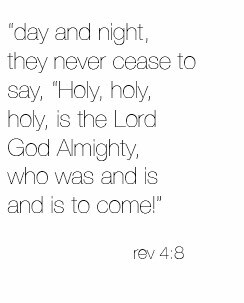 I love quiet books for church! I didn't have a potholder, so I made one. stitch them together as a play mat for a baby. tie ribbon/toys onto the loops for sensory activities. checkbook? coin purse? you could put a flower on and make a wall hanging. Sew them down as fun contrast pockets on little outfits or purses. ... Make meals for people who are sick and bring it over with a cute potholder. Or if your church has a meals ministry give them a stack to do that with... Can't wait to see what you make. No ideas here but that's hilarious! I think you should make placemats for the kitchen table by sewing them together. It would be so bright and summery for breakfast! I was so excited to see this! I did this on my blog a few months ago but what is so wonderful with yours (the print is adorable) but it is really hard to find just the regular square shape. Mine had some of that extra length so I had to work around that. Yours is so so cute! Not big on putting links to my blog but here it is in case you want to see it. I just thought it was so great we both did this. Since it has your church's name on it already, I love the idea of using them for what was probably their original intended purpose - missions/food ministry. We have a food basket ministry at church and deliver meals to shut-ins or families with lots of children who might be less fortunate. Slip one of these cuties in and voila! they know where it came from and they have a permanent reminder! I love the scissor case idea too or just making more eyeglasses holders. Here's my tutorial on the emergency/first aid kit. My family loved these when I made these as gifts for them. How about an Ipod/Touch Case or sewn together as a CD case? These are so fun and the ideas are endless~ I love that you rescued them. I think you could do handle pot holders like for a cast iron skillet. They could just slip over the handle. I hate how my big ones get in the way. These could also be use for a 5 point seat belt cushions for baby car seats. How about folding them in half with velcro and using them to gather all your computer cords! Just some ideas that popped into my head! What about sewing them all together to make a big table cloth or picnic blanket?? It might be a little thick, but you could sew them with intended gaps like it was a lace table cloth or something. Or I really like the place mat idea! Can't wait to see what you make with them! yes give some f them to your readers. Especially me!! Sew a couple together to make a potholder "glove." Also four sewn together would make a sweet dolly blanket. LOVE that print. I agree that you could host a little giveaway, but I never win any of those, so . . . Anyway, can't wait to see what you make with them! Love finding little treasures. Why, party bunting of course! How lovely they would look knotted on a rope and swagged between trees in a garden over a late afternoon summer supper. I also like the cellphone case idea. Only because I was trying to find a tutorial on that a few weeks ago. How fun! I love finding "treasures"! This is an 'out there' idea, but you could turn it into a quiet book! Just sew different things onto the hot pads, and attach them on an end to make a book and you're set. obsessivelystitching.blogspot.com has a whole week's worth of posts about hot pads! Very cute print... love it! A changing mat that folds into a bag!!! A picnic blanket/pad for taking to the park! That would be awesome. They are cute!!!! You could make up some felt food, stick them in a giftbag with a potholder and take them to a children's hospital. That kind of stuff is great for playing in bed if you have to. Care at Obsessively stitching did a whole week of pot holder crafts. She had really great projects, you should check them out!! MAKE A QUILT FOR YOUR DAUGHTER'S BED. JUST LINE THEM AND/OR ADD COORDINATING SQUARES TO MAKE IT BIGGER! THERE MIGHT BE ENOUGH FOR A DOLL BED, TOO!! HAPPY SEWING!! the ladies at my church made them into first aid kits, or little activity bags for their kids to use during church or when you want them to be quiet and occupied. They sewed little snack size ziplock baggies in them and fill with the items you'd like to use. I put little activities in them for my kiddos. It's very portable and easy to do. My son uses it to park his cars in after he pulls out all the stuff in the baggies! too cute! Coasters & Tea cozies! I love that print so much!! The glasses is such a cute idea. I loved reading the ideas from others in the comments section. I think my favorite is to make them into scissor holders. I definitely see a cute doll blanket and pillow set for Paige. I am sure you will wow us with something adorable. I turned a potholder into a little case for my curling iron or straightener. It works great. Cute idea with the glasses case! Maybe you could stitch some together to make hot pads for your larger pans. Sew two together and make a little snack sack, for crackers and such. Cute glasses holder! I came across a cute little make-up bag made out of pot holders. These pot-holders would look great as one! I think a quilted purse or bag! how cow! i wonder what your church was thinking. there are so many! I'd love to take some off your hands! I don't know if anyone else said something like this, but I stitched a potholder together and used it to 'house' my flat iron. It makes it especially easy to throw your flat iron in your bag on the run. Besides, you are the craft genius! I can't wait to see what you come up with. sew them all together and make a picnic blanket?? are there enough? Maybe? I second the first aid kit idea from southern belle. I've seen those before and that was the first thing I thought of. Tablecloth or wall hanging. Those are cute. Fold a potholder corner to corner to make a triangle, wrong sides together. Gather a small towel in the middle and sew it to the right side of the potholder along the fold. Sew a button on the top of the potholder and poke it through the little hanger end of the potholder. You can now use it on your stove handle as a kitchen towel. those are cute!! I want one! Maybe sew a bunch of them together to make something like a quilt... maybe a picnic blanket, or an outside baby blanket??? I liked the idea of sewing them together to make a tote as well. Does your church do Vacation Bible School? If you came up with something simple that kids can do, they would make a great VBS craft! So cute! Maybe sew the edges together for a padded picnic blanket? I'd so them together for a picnic blanket. marry a kitchen towel with a potholder for a doubly useful gift/household item. Make them into kitchen scizzor holders. If you'd like a picture, I could email you one. Let me know (reply to this comment). They are really cute & there are patterns for them on the internet if you search for it. All good ideas! I dont know if this one was mentioned yet but I would use them to cover car seat straps so the starps dont rub on the kiddos! You could use them to make a child's color book cover. Make slots for color crayons(on one side) and attach a small notepad(on the otherside). That design is cute! You could cut them apart and add some other fabric to make a quilt. If you could find a way to remove the loop without it looking like you cut off the loop, you could use them to make awesome patch pockets for a skirt or apron. Or could you somehow use them to make an Advent calendar? The loops could be used to hang them from a garland? It would be some nice thick quilt blocks that could probably retain heat really well seeing as how they are potholders. Forgive the obvious suggestion of appliqué. Mini fabric frames? Fabric message cards? I bet you could make a quilt, that would be a great picnic blanket. You're so hilarious! 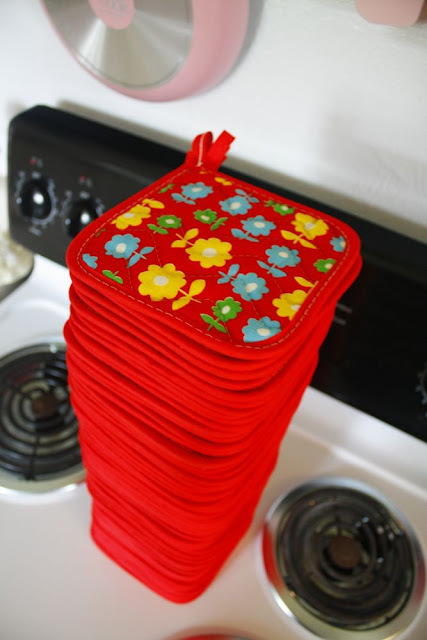 I love the stack of 68 potholders. Cracked me up! As for ideas, I can't think of any right now coz I'm still cracking up. "Potholder ministry"... LOL! So quirky, I love it. Hey, why not just use them as pot holders? oh my gosh. disney...LOVE these! I'm so happy you found them! and the glasses case is darling. I say....make 68 glasses cases and either sell them....or hand them out to all the ladies in your church who wear glasses! Glad you posted about it! Very cute idea of the glasses case. And thanks for the pot holders ministry. I might sue that for our women's group at church!! crear una bolsa para niñas. 6.- Hacer un tag con otros retazos. I've seen them sewn together with zip lock baggies inside to hold crayons and then a small pocket sewn to one side to hold a small note book and you have an instant quiet book for the kiddos at church. This blog had cute ideas. I just made 30 pot holder first aid kits for a youth retreat this month. I made one for myself 4 years ago and I LOVE it. It is still in great shape. Those are the cutest hot pads I've ever seen. Could you send two to April who's sister is struggling with chemo? My mom went through it 10 years ago and it still makes me cry thinking about it. Cancer affects the whole family and community. A quilt! it would be so fun to bring on a picnic! First, a giveaway would be cool. Maybe something big like one per person for 30 winners. Otherwise, if you belong to a guild or group it would be nice to make a gift out of them. Rotary cutter holders, scissor holders. You could hand sew a little loop to button it so they don't come out. Or just make them a stuff a fat qtr. in it as a gift for friends. You could run a curtain rod through the tabs making a cute kitchen window valance? totally cute! i think I shall have to make one too, so easy! My sunglasses are always getting beaten up in my purse, this is perfect! Hmm, You could make a cute table runner with them! Or perhaps homemade knockoff Vera Bradley ware? Sew a couple together as an adorable purse for Paige, with some vibrant yellow as an accent color for the strap and other details. Also- iPhone cases, laptop sleeve, and funky patchwork throw pillows. 1. for the others - post them randomly in letterboxes.... with a little tract to spread the "word"
2. give some to the local kindy. Kids love playing "kitchen"
3. make up a recipe jar with dry ingredients, instruction note on what/how to cook it up and a hot pad. 4. Sew several together to make a doll quilt and dolls pillow, larger hot pad of the kitchen, a hot water bottle cover. 5. Make several into a material book. sew in some fabric black silhouettes and it would make a great baby book. 6. sew some together to make a kids apron. 7. hmmm i think that is all I have. love to see what you do with them all. I have a sewing kit made from a potholder, and when my friend saw it she DEMANDED that I make her a wallet in the same style. For her birthday, then, I took two folded-over potholders, nested them so that I had two inside pockets and a flap over the top, and sewed the sides together. One loop was sewn inside and the other was left hanging out, and I added a button and loop to hold the flap closed. you could make a quiet book (or several) out of them. i love the pattern! too cute! maybe a table runner so you don't have to put potholders down on the table, just place the hot dishes down the center. I'm sure you will think of tons of ideas! sew two together and make a sandwich bag :-) might wanna line it with something though to make for easy cleaning. I have no idea...but that's hilarious! Love your new sidebar pic! very cool! here's one i saw from Jessica over at happy together..potholder clutch! Sell them or do a giveaway. Do have an etsy shop? I had similar ideas to what everyone else posted here. The fabric is just awesome... I wish I could find fabric like this! If you do giveaways I want to be entered! Cute!! I would... Not sure! love all the random things u can find in cupboards in churches!!! I just love the fabric! You could take them apart and just have 2 pieces of the flower fabric for every potholder. You might need to get some other color fabric to go with it just in case. You could sew them together and make a quilted skirt! How cute would that be? i love Nappy Miss Sew 'n Sew's idea to sew them into an outdoor playmat! makes me want to go find some vintage potholders and make on for my son! they are such a cute pattern though! i just can't believe your church had THAT many . . .
Rachael Ray Moppine Oven Mitts! Like a really big table topper for church picnic or bake sales, playmat, hang them all on a wall evenly spread apart so that would be a really fun pop of color! sew a few snack size ziplock bags in the center and use them for a first aid kit. Make more glasses cases & sell them as a fundraiser for the church! Do something fun with the money, like to a community art class hosted by your church. A little girls purse, just stick two together and add a strap! I love it! I save things like that too. I think of a couple of projects to do and then sit there and stare at the extra 100 I have! Maybe you should sell some of your eyeglass holders on etsy? Retro prints are really in right now. I've also seen pot holders folded into a triangle by setting them on point and then folding both "wings" to the middle and use as a scissors holder that hangs up. I'd sew them on point as a hotpad "Runner" to use at dinner time. I would really love to see a potluck carrier out of them! The hotpad "runner" is a cute idea too. Very cute! No matter what you decide to do with them I know they'll be gorgeous--they *will* need some ruffles of course (wink). I don't know about how to use 68...but I used 2 to make carseat strap pads for my daughter. The straps kept rubbing her neck, so I just folded them in half and sewed down the long edge. No more rubbing! I once saw curling iron holders/cases out of potholders so you can put your iron away hot and not clutter up the counter until it's cooled off. I can't remember where I saw the tutorial, but I'm sure you could figure it out! make more glasses cases and sell on etsy! There are 135 comments so this may have been already suggested but you could make a pot holder bunting? That print is so so pretty. What a lucky find! Someone suggested a basket, and I think it would be beautiful! I will be awaiting the photos of what you will create with them. How about a giveaway? I love the fabric too! I posted an entire week's worth of potholder projects last year called POTHOLDER WEEK -- five ideas of things to make from potholders!! Check them out!! What if you sent a few to your readers and see what they can come up with? And yes, the print is ADORABLE. I've just spent far, far too much time traversing your blogland. Laundry to be done, bathrooms to scrub ... but my visit here has been far more enjoyable. You could give them to me! Haha. I would sew them into a rectangular messenger bag and then make flowers with the blues, yellows, and greens of the potholders and put them on the purse! Just yesterday while riding home from church in a dear lady's jeep. I noticed a folded over sunglasses case hanging from one of the knobs on the dash. Leave the loop up, and sell at a craft show or use open as is as a hand out promoting your church. Have you ever seen those tiny silicon pot handle holders? You now have little "mittens" for those metal handles! I didn't read through all the comments, so if this is a double post, please excuse me. I go to the Dollar tree and get matching kitchen towels and potholders. Fold the towel in thirds, so the print is out front, and it is folded the same width as the potholder. Iron. Then fold the length in half, iron again and mark the fold line with pins. Fold the matching potholder in half, loop at top. Simply sew the center of the potholder to the center of the towel. Then you sew a button opposite of the loop of the potholder and you have a towel to hang on your oven handle. I have dozens because they are great for a quick wiping off of your hands while cooking. 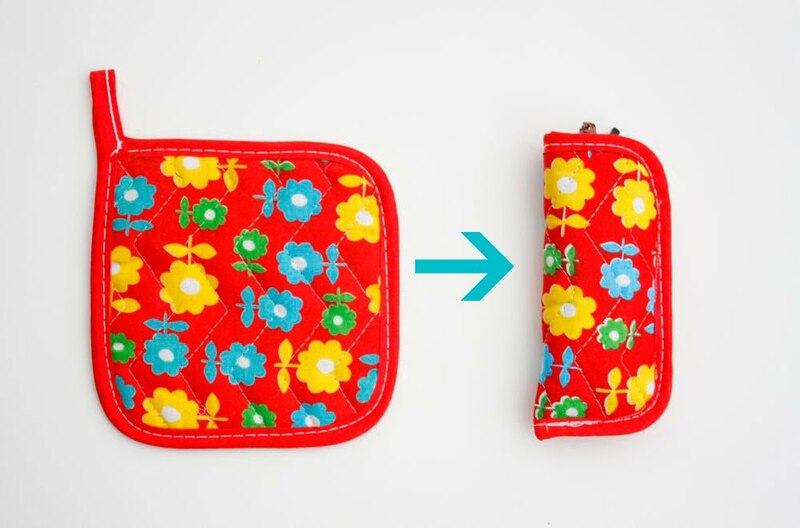 Sew like on the eyeglsas case example but instead make a change/coin case. Woven ptholder coin (2) case on Etsy is an example.